Vegetative Description: Large bulbous (with rhizomes) plant with large palm like leaves and thick, spongy stalks. Tasting Note: The thick, spongy stems have a very mild, grassy flavor. 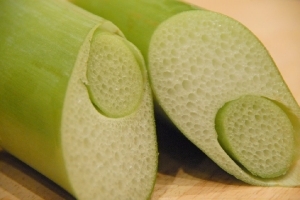 Culinary Uses: Stems (petioles) are peeled then cut up to cook in fish soups and some stir-frys. The sponginess texture of the stems absorb the flavors of the soup and adds texture to the dishes. Log in | 72 queries. 0.196 seconds.